First and foremost, a drum machine will be the first tool required in order to create a cool hip hop song. Unfortunately, most quality drum machines in this day and age are very expensive with some ranging in astronomical price points of upwards to a thousand bucks or more. However, I recently stumbled across a really cost effective drum machine app called iMPC developed by Akai professional and retronyms in the App Store for only $4.99. This app is very user friendly, and is currently available for the iPad or iPhone. What makes it super awesome is how it enables any aspiring or entry level music producer to quickly conjure up a hip hop track anywhere, anytime because of its portability. Furthermore, once a track has been recorded in this app it can be subsequently uploaded to a website called Sound cloud via Cloud seeder, and a multitude of other social media sites. This is super cool because it allows you to get some feedback from all of your immediate peers and associates as well as other fellow music makers in search of a little friendly competition. You are also able to leave comments on other music producers profiles as well. Feedback is critically important as it will push you to work harder when your not getting many responses. It can also be a good indicator of how well your production skills are developing. I currently have an active profile on soundcloud.com where you can preview some examples of my work. My profile name there is Space-tunes. More importantly, it will further illustrate how anyone can easily create some hip hop tunes with this incredibly affordable iMPC app. I have also recently met and joined forces with an extremely talented league of up and coming super producers named the,"IMPC GREATS." In essence, I have personally been using Akai products for several years now, and can confidently affirm that Akaipro is by far the champion designer when it comes to crafting some really impeccable drum machines for hip hop music since 1984 hands down. 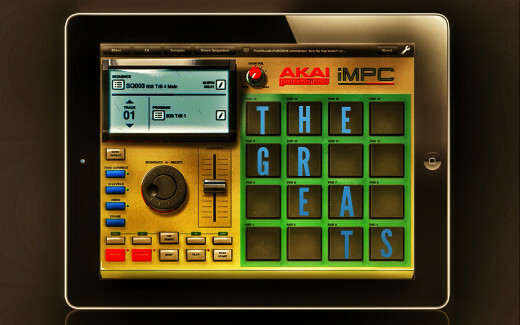 My very first drum machine was called the Akai MPC 2000 which allowed me to create most of my earlier work. A plethora of today's top music producers such as: Dr. Dre, DJ Premier, Timberland, Swizz beats, Kanye West, Just Blaze, and so many others currently use, or have used the Akai MPC drum modules on most of their biggest projects. Above all, the iMPC app is definitely a breakthrough concept in so many respects because of the ability to create music virtually anywhere minus the power cord dependency. But, it is not about the type of instrument your using...it's about how instrumental you are with your imagination! So, let's get started...once you have downloaded the app from the App Store, I will provide you with a comprehensive walk through on how to create a really cool sounding hip hop song. In the main screen click on the the sampler option at the very top. 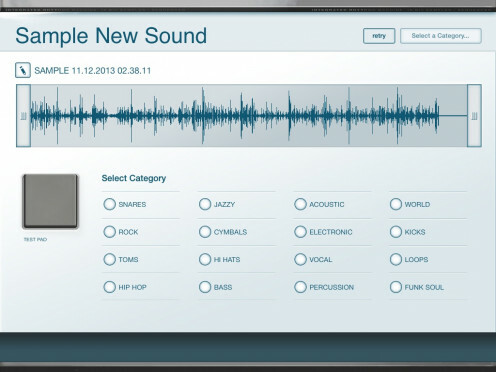 The sampler will enable you to capture your own unique samples directly from any song of your preference in your iTunes library. This sampler screen can be reached from what is referred to as the Transport in the primary user interface or the Program Editor. Below you will find that I have clarified each feature of the sampler in order for you to have a more definitive understanding of how it works. The record arm allows you to place the recorder in record mode. Once a record signal can be seen, you will need to tap this button in order to begin recording. It can record from the iPad mic or from the Music Library. Tap the button again to stop recording. Another cool feature in the iMPC is called AudioPaste because it allows you to import samples directly from other apps within your iPad. Once you've completed the importing of a new sample, a saving option will be displayed. 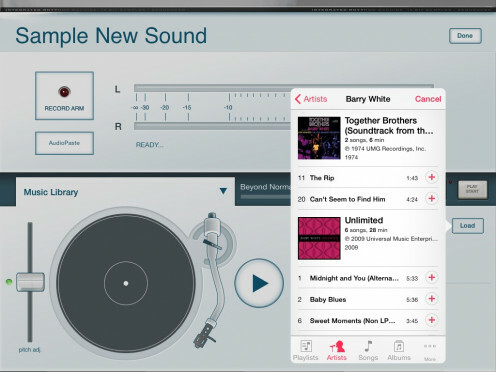 You will need to access your digital turntable in the sampler mode in order to have the ability to open and play songs from the iTunes library. Access the iTunes library. Choose the song that you wish to sample and hit record. Allows you to alter the pitch of the song on the turntable. The tonearm is actually similar to an actual turntable tone arm because you can change the playback position of the song. The Music Library can be hidden by pressing the blue triangle icon on top of the bottom of the tonearm. 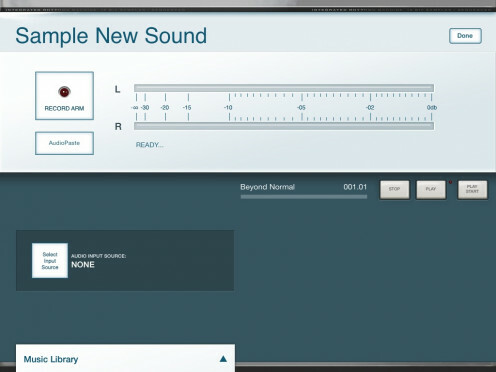 Once a sound has been captured, the option to save that sound opens up in a new screen. It is important to press the edit button adjacent to the sample name in order to rename your file. You should always name your files because it's easier to find them later on. If you are not satisfied with your sample for what ever reason just hit Retry and you can go back to the previous Sample screen to re-capture a new sample. Allows you to save a sample to a preferred location. You will have to choose a category before You be allowed to save that sample. If you decide that you only want a part of the sample you can truncate (cut) the beginning or end points of the bars at either side of the snippet in order to get the desired sample. Plays back the actual sound from the sample within the waveform that was captured. Select a category to save it in that section. A category has to be chosen for a sample prior to being saved. I believe it is absolutely imperative to listen to an entire song first to explore if you can hear a snippet that's worth sampling in order to save some time. I personally like to sample tiny snippets of the entire song from beginning to end in order to re-arrange them later on. For instance...let's just say you have decided to sample the Beatles song,"The Sergeants Peppers Lonely Hearts Club Band, written and recorded by John Lennon and Paul McCartney. I would sample and isolate several words, (We're...Sergeant...Peppers...Lonely...Hearts...Club Band...We're...Hoping...You...Enjoy...The Show.) Now, that you have captured each individual sample across several different pads...you can re-arrange those samples in a totally different order. For example: The Band Hopes...You Enjoy the Show! Enjoy the Show From Your Hearts...Lets Go! Or whatever you prefer of course. You can also use that newly re-arranged wording for an eight bar chorus in your song. Please note: I am not recommending that you chose this particular song for sampling purposes in any shape or form, it is simply an example. Additionally, if you find that there are various percussion sounds already in the background of your samples, its really no big deal because you can always add a filter effect later on which will act like sort of a (sound muffler) on that sample and mask those additional sounds or voices if you desire. Sometimes those added sounds in the back round of a sample may sound pretty cool when the pitch has been adjusted. It's all about your individual preference really. You may not want any voice samples or Dj Scratches in your song because that is not your personal style as a producer. What you don't want to ever do is sample a snippet of a song, and it be immediately recognizable. Anyone can do that, come on! I find that a producer is much more highly regarded, and respected when he or she creatively re-arranges a song either by slowing down the snippets or speeding them up a bit. More importantly, he or she should create an entirely new song from his palette of newly sampled chops. A song that no one can easily recognize or identify right away. That's cool! Now, lets get a song started. A sequence in the iMPC only allows you to create four individual tracks which can be mixed down and tightened up later on by a professional engineer once a song has been sold to a major record label for mass distribution to the public at large. It is also important to mention that retronyms is great at releasing helpful updates for this app periodically. The iMPC user guide will meticulously outline how to create sequences, but I will briefly explain how to do so right now. You will find what appears to be an old school tape deck type styled recording set-up at the bottom left hand corner of your main screen. This is what you will use to record those samples in a timely manner. The metronome (this makes a counting click sound.) It is usually activated in record mode, but it will also allow you to flow, and audition your samples at a certain tempo (speed) to see what works prior to recording anything. Once you have decided which speed works best for your samples, you will press the record or, and play button simultaneously, and then count down to four at whatever speed you have selected. Upon reaching the end of your four bar count..you can start recording while playing your samples as if you were playing an instrument. The record over-dub button allows you to add another sound on top of the previously recorded sound. I personally start most of my sequences with the sampled melodies on track one and then the drums on track two. Most sequences for hip hop tunes typically commence at 86 BPM...which stands for (Beats Per Minute)...basically the speed of the song. I usually start most songs with two bars because its one of the fastest ways to work for me. 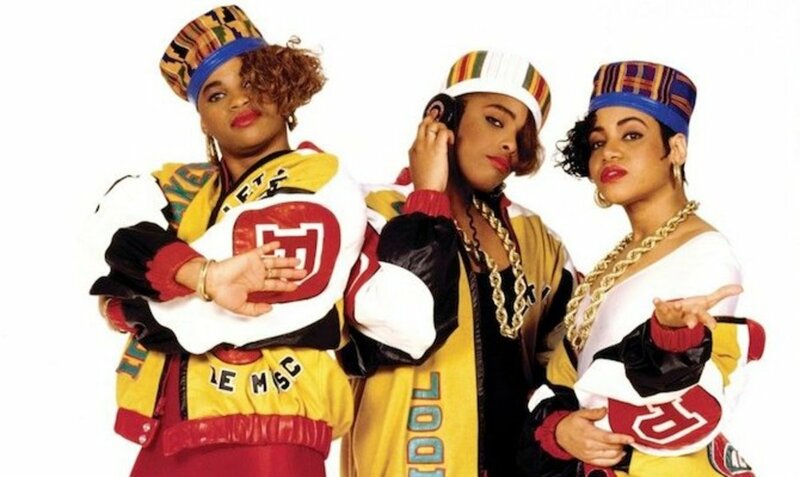 However, the BPM's will vary from song to song because some songs are more dramatic than others while some consist of a more up-tempo party type of vibe. If you are satisfied with your recording simply name and save your progress...if not, you will hit undo as this software is non-destructive and it will allow you to start the recording process over again. As a rule, you should make it a habit to always save, save, save your work as you go along because practically any music application will crash at some point. It has happened to me numerous times and I almost lost my mind in those instances, but experience is the greatest teacher. I now save the progress of my music as I go along at each an every step, so that I never lose my work again. Practice makes perfect...if this is what you really want to pursue from the bottom of your heart, go for it! keep in mind, that failure is inevitably a part of success no matter which way you look at it. Nevertheless, you will acquire some priceless life lessons when you fail at something, but it will push you even further towards your goals as you continue to expand your musical capabilities! Anyone can become an expert at anything they invest a great amount of time into at the end of the day. I only regard myself as a work in progress because it keeps me infinitely hungry to create new music. 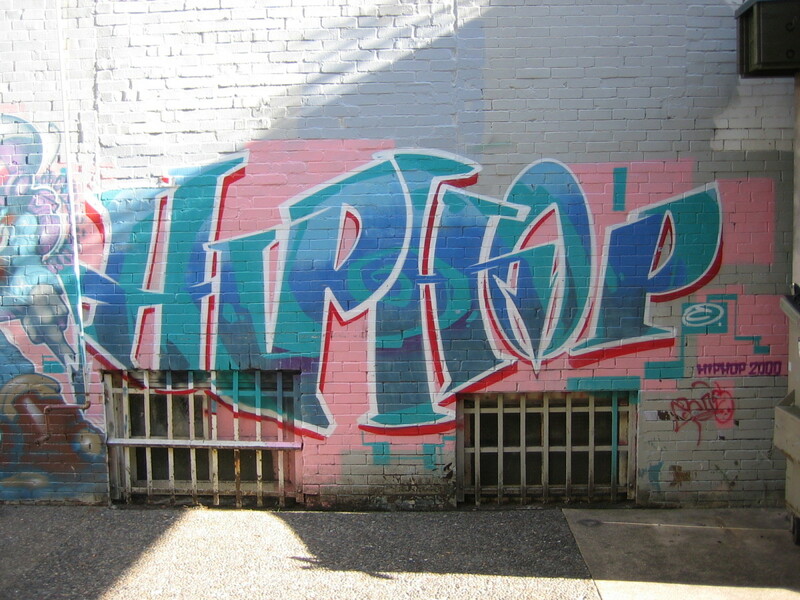 In summary, what does it take to create a cool hip hop song? It definitely takes someone who is passionately committed to the craft of making music that will leave your audience with an indelible impression of your sound on their minds. Comparatively, it is again extremely vital to have a keen understanding that the most important instrument in any music production is ultimately the users imagination, and not necessarily the drum machine you are working with at the moment. 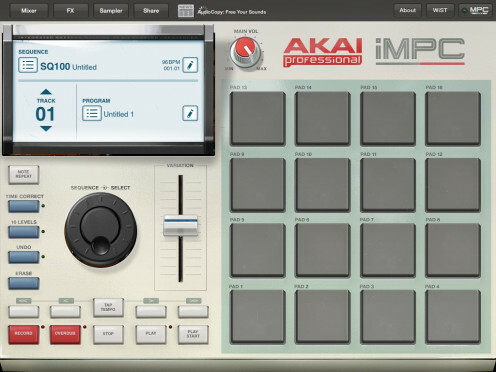 However, the akai professional drum machines including the (iMPC) app will certainly make a huge difference in terms of sculpting new music with dynamic tonality. Lets face it, anyone can hit the record button on a sampler and capture a snippet of a popular song...create a loop of that sample and viola...a new song has been created. But, that's just far too easy, unoriginal, and lackadaisical. The challenge is being able to re-create an entirely new musical mosaic from a pre-recorded song, so no one will be able to immediately know exactly where it came from. Sooner or later, the public will eventually learn where the song derives from if it gets sold because it is the law to copyright your work through the library of congress, and register it through a publishing company such as ASCAP or BMI. At any rate, you will eventually discover what your individual preferences are as a producer as your musical talents begin to unfold and evolve. You will also learn how to maximize your potential each time you make a mistake. All things considered, when it comes to creating a cool hip hop song, a cool drum app, determination, patience, and desire are probably going to be the most important attributes that you will need to harness. Another amazing development has come into fruition from this incredible music platform. 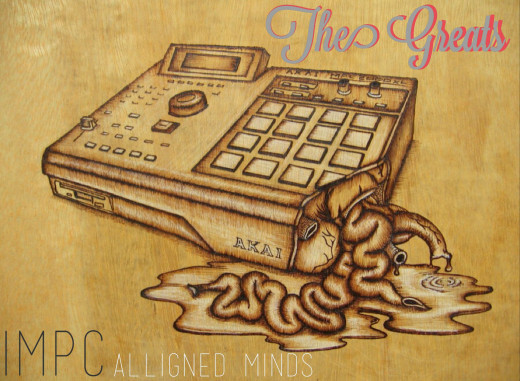 A dynamic beat team has been assembled from the iMPC Cummunity, and it's called,"iMPC Greats." The team consists of several diversified music producers from all across the globe. Please refer to: (www.soundcloud.com/impcgreats) for additional information. All of these producers are future stars in the making for sure! StudeeOB, Spacetunes, Sirname, Jerry Pizzini, Waterhouse, Smoovbeats, Op-thomas, D.J Troubleman, Jay Napier, Bruce Bangga, Lorikscrill, Jordwin, Pasik, WhoEverKnew. Please check out their individual pages on Soundcloud as well. The level of talent you will hear will further demonstrate how multi-faceted we really all are. Who Do You Think is the Best Hip Hop Music Producer? Since then, Akai Pro products have become a fixture of modern music both in studio and on stage. 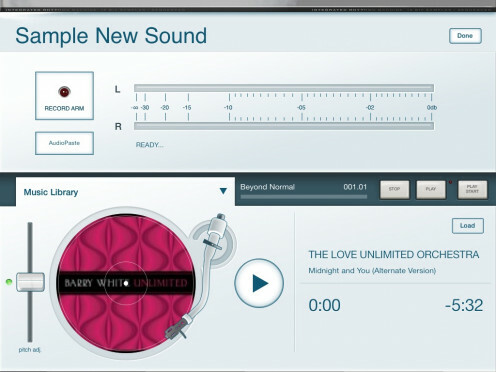 The refinement of our digital sampling technology has become the building block of today's most popular music. The uniqueness of our MPC sequencing samplers has forever changed the way modern music is created by enabling digital samples to become the basis for composition. Akai Pro stands at the forefront of digital technology and remains one of the most influential manufacturers of musical equipment of the last 20 years. Please feel free to drop me a note if you should have any more questions regarding additional tips for sampling. I also provide one on one hip hop music production lessons at a reasonable rate for anyone interested in New York City. I can also help you shoot a high-definition video as we have state of the art video equipment...please feel free to reach me through www.soundcloud.com/space-tunes ( johnartise@facebook.com) or shoot me a text only at (347) 719-4651. Please note: ONLY text messages will be answered as this number can only receive text messages. Disclaimer: All songs have been independently created by John Artise AKA,"Space-tunes." The majority of songs on soundcloud were made with the iMPC app for promotional purposes only whenever advertised on www.soundcloud.com/space-tunes. None of these songs have been mastered, engineered, registered or even hold any sort of copy right permission. No copyrights have been violated because none of these songs that contain extrapolations are being offered for sale or have been released. In addition, some songs may be interpreted as offensive or derogatory by some groups. It is not the creators intention to offend anyone herein deliberately as these songs were created solely for entertainment purposes only. Listening discretion is advised as some of these songs may contain explicit language, and most of these songs may not be suitable for a younger audience. I will not be held liable or accountable for any misunderstandings regarding the content within some of these songs. These works are strictly for entertainment purposes only and are in no shape of form a reflection, and or extension of my reality or life experiences at all. I am also not affiliated, and hold no claim to being associated, and or under contract with Akai or retronyms at all. Fill a medium pot with water and allow it to boil on high heat. Next remove the fish from the bag and chop it up into medium sized pieces and simply drop it into the water. As your waiting...chop up all of the vegetables, the tomato, onion and avocado into bite size pieces. Allow it boil for about 15 minutes, then replace the water with hot water. Wait another 15 minutes. This time, taste the fish to make sure that most of the salt has been removed. One hard boiled egg can also be dropped into the boiling pot of water for additional protein, but it's optional. If you do opt to add it...after it boils, chop the egg finely, set it aside, then add it to the mix later. Once you feel that most of the salt is gone...it's done. It's a bit tricky because you sort of have to keep on tasting it periodically as you go along to make sure it's not over salty or under salty. Some folks prefer it to be saltier than others...so to each is own in terms of salt. I prefer that most of the salt be gone. Once your completely satisfied with the level of salt. Drain the water, add your tomato, avocado, and onion into the same pot and mix it all up. Drizzle a generous amount of olive oil all around the mixture. Welcome to the Carribean! Enjoy! Some folks like to have this dish with some rice, but I prefer to have it with one boiled potato sliced into moderate sized medallions and drizzled with olive oil, Kosher or Sea Salt & Black Pepper. Alternatively, a sweet potato would certainly be the more health conscious option. Another tip for a less pungent taste on the onions is to allow them to sit a bowl of cold water with a teaspoon or two of olive oil until the fish is ready to be mixed. Thank you for a great and informative article!